Believe it or not, a well-crafted knot could save your life. The Hollywood Reporter recently announced that famed film producers Weinstein & Co were buying the film option on Paul Tough's riveting New York Times article about an east-coast fisherman lost at sea. All told, this fisherman's tale is an ancient story with an amazing new twist. Central to his harrowing story of survival at sea is the fisherman's good sense to 'tie on' securely between two floating lobster trap buoys to stay alive. The likelihood that he would have survived this anxious ocean ordeal without a well-crafted knot is, frankly, unbelievable. We forget about knots. We forget that they often play a vital role in our cognitive and motor skill development. One of our first mastered skills - separating us from 'a baby' to 'a child' - is to tie up our own shoe laces. That over-and-under-loop-twisted-wrapped-tucked-pulled-through-loop-pulled-taut manoeuvre is actually known as a 'slippery reef knot'. Our mastery of this complex skill is evident when our knot is secure: our laces do not come undone. Traditionally, Boy and Girl Scouts learn the basics of knot tying early on. We continue in life to use knots for a multitude of utilitarian purposes. We use them to put a 'bow' on a present, fasten items to cars or trucks, tie up boats to docks, end a thread, secure a flopping turkey ready for the oven, hitch up to a post, secure a dock, tie a tie, tie a cloth belt, knit a scarf and secure straggling tomato plants to stacks. We use them daily around the house, cottage, garden and our work sites seldom conscious of that rudimentary knot tying skill that we learned so very long ago. Today, though, because of the pervasiveness of newer time-saving inventions like the zipper, Velcro and plastic zip-locking clasps, we are in danger of losing this ancient craft: a well-tied knot. Dave Lambert, 61, has been tying knots, like us all, since he was a kid. But he really got hooked in his forties after spending a month alone canoeing and camping in the North Ontario bush. When he retired, he picked up the definitive Ashley Book of Knots by a third-generation New Bedford Massachusetts seaman and artist, Clifford Ashley. First published in 1944 after 11 years of research by Ashley, this "bible" of knots remains the indisputable knot tyer's encyclopedia and reference manual. It is filled with detailed illustrations for over 4000 knots. What separates an amateur like you and me from a Master knot tyer like Dave Lambert? In a word, patience. The standing test for an accomplished knot tyer is the time-honoured 'Two Minute Challenge'. Knot tyers must demonstrate a keen focus and agile proficiency tying six relatively common knots - the Reef Knot, Clove Hitch, Sheepshank, Round Turn 2-half Hitch, Sheet Bend and the Bowline - within the given time frame. The best of the bunch can do it in well under 30 seconds. 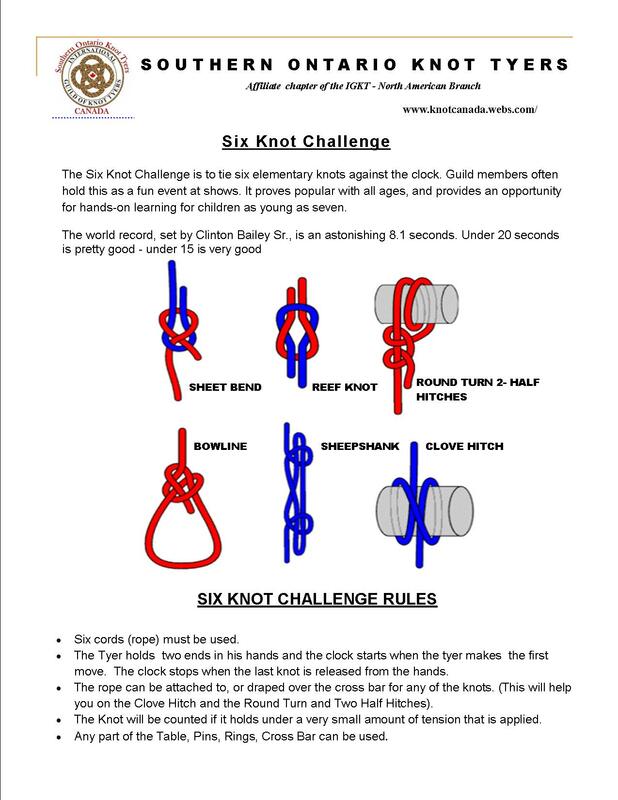 Go on, give it a try: The Six Knot Challenge. One of the highlights of this event will be a talk on Saturday night by Gill Bibby from the Hamilton Scourge Project. For those who don't know, two American schooners, the Hamilton and the Scourge, capsized in Lake Ontario in 1813 in approximately 100 meters of water. These two shipwrecks are the only complete 1812 'war ready' ships in the world. Naturally, a detailed recap of their Great Lakes adventure will be an enticing yarn for knot tying enthusiasts. Dundurn Castle Coach house logo - Relink to MAP link as above. Consider it a welcome opportunity to learn something new about a very old-world craft. Your life could well depend on it, even if it is a hangman's noose, monkey fist, or cat-o'-nine-tails. Not just for pirates or seamen, a well-fashioned knot - whether in rope, braided cord or coloured thread - holds an intrinsic ingenuity, tensile strength and an honest hard-earned beauty. Just think about that the next time you quickly go about tying up those shoes. Wow, very interesting, and a great youtube video. It's nice to see how versatile something like rope can be when used by someone who has the proper skills. Thanks Robert D. And yes, totally agree - rope can be very interesting! Correction: Showing at The Staircase Theatre, 27 Dundurn Street N. Line up of Documentary shorts start at 7pm.